The oral cancer death rate is high due to late discovery...The solution…early detection! 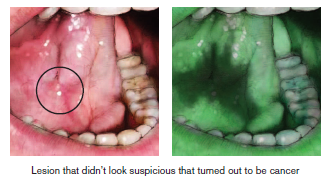 Sapphire® Plus Lesion Detection is new adjunctive technology that, in addition to a thorough visual and physical oral exam, allows your dentist to potentially discover oral lesions early. Without the aid of Sapphire Plus Lesion Detection, cancerous and pre-cancerous lesions could go undetected and possibly spread, causing pain, disfiguration or death. The earlier cancerous and pre-cancerous lesions are detected, the greater the chances of successful prevention, treatment and recovery. Why should I get screened with Sapphire Plus Lesion Detection? It’s painless, takes minutes and it could save your life. When it comes to oral cancer, early detection is key. Getting screened is an effective way to discover oral cancer at an early, highly curable stage. With Sapphire Plus Lesion Detection, your dentist can even detect lesions before they produce any pain or symptoms. So see your dentist for regular screenings that include a thorough visual and physical oral exam and Sapphire Plus Lesion Detection. Please contact us if you have any questions or would like to schedule an appointment. You may also use our online appointment request form to schedule your appointment.